Have You Registered For Photo Week 2017 Yet? CreativeLive's biggest online photography education event is back - Photo Week 2017! With 40 expertly-designed classes taught by 16 of the industry’s leading photographers, you can learn awesome photography tips to help you continue to grow and launch a successful photography career. Be sure to RSVP for the live event that takes place October 9 - 13th! Photo Week 2017 will push creativity skills with on-set classes focused on lighting and posing. Learn essential steps to set up a business and brand as well as effective pricing techniques to help shape realistic goals for a profitable business. REGISTER FOR PHOTO WEEK 2017 HERE! Instructors include award-winning, published, and widely followed industry leaders including: Lindsay Adler, Ben Hartley, Scott Frances and MANY more! During the FREE live streaming event, CreativeLive will be hosting instructor-led daily critiques. Receive direct feedback from photography experts to grow skills. Don’t miss out on their tips and advice on becoming and thriving as a professional photographer. This event is totally FREE! You can watch any class live for free, and it is all totally online. Click here to register. For only $199, you can get the entire bundle which includes all 40 classes, all 5 keynotes, all 5 critiques, and all in HD — on demand to watch anytime. Buy now and get everything at an 87% Live Conference Discount! Click here to register! Don't Miss Out On Photoshop Week 2017! Whether you are an expert photographer who has been in the business for years or you are just beginning on your photography career or hobby, you do not want to miss out on Photoshop Week 2017, May 15-20, brought to you by CreativeLive! In only 6 days of classes, you can master Adobe® Lightroom® and Photoshop®... and there is so much amazing stuff to learn! Photoshop Week includes 42 dynamic workshops taught by 16 world-class instructors including Lindsay Adler, Jesus Ramirez, Khara Plicanic, Dave Cross, Jared Platt, and more. You will learn everything from compositing to masking to layers, and how to cut down the amount of time you spend on post-processing. You will sharpen your skills which will help you with your photography business. REGISTER FOR THE FREE LIVE BROADCAST OF PHOTOSHOP WEEK 2017 NOW! Transforming standard images into beautiful, powerful photographs using Blend Modes. If you prefer to have on-demand access, purchase for $299 and you will recieve 42 video classes in HD, and will have lifetime access to the classes anywhere and anytime. You will also have access to streaming and downloadable files and all is availalbe on desktop, mobile and tablet. Don't Miss Out On These Free Photography Classes From CreativeLive! 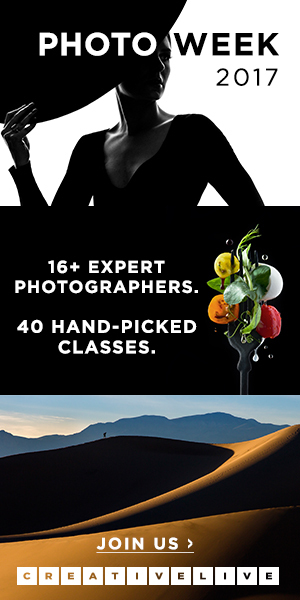 CreativeLive is offering some great photography classes in the upcoming weeks that we just HAD to tell you about! The best part is that all their classes are FREE! You can join thousands of other photography students, learn some great stuff about photography, having a business, staying inspired and so much more and also get your questions answered by their expert instructors. Here are a few of the FREE classes they are offering on CreativeLive over the next few weeks. Be sure to click here to find out the specific days and times they are each offered. This is just a few of the great classes that are being offered so be sure not to miss out on all the great classes you want to get in. There are also classes on social media, visual notetaking, branding your business, using Pinterest to help your business, videography and so much more! And remember, they are all FREE! Be sure not to miss out on these great opportunities to learn more about your craft, passion and business. You must register for the classes you are interested in so you can reserve your seat so make sure you check out the list of classes now.